This tour starts at 8.30am. You are picked up from your hotel by your guide. Drive north of Chiang Mai to Chiang Dao (approx. 1hr) to the elephant camp. At the elephant camp you will see the elephants taking their morning bath and demonstrating some of their skills. Afterwards take an elephant ride for approx. 1½ hrs to a Lisu hilltribe village. The ride takes you through some of the lovely forest scenery and along the river. After lunch take a bamboo raft trip down the river for approx. 1 hr, admire the scenery and absorb the tranquility as you float down the river. Drive a few kilometers further to a Padong "long neck" tribe village. 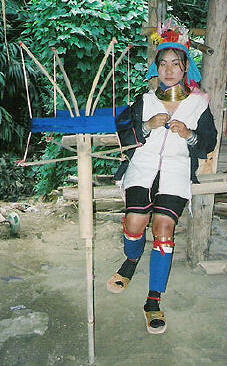 The women of the tribe wear long brass coils around their neck which actually pushes the collarbone down, giving them the appearance of an extended neck. This tribe has come from Burma as refugees in recent years due to the persecution of the Burmese government. Spend some time in the village and then drive back to Chiang Mai in the afternoon. This tour ends when you are taken back to your hotel at approx. 5pm. Note: This is a private tour; entrance fees and lunch are included. Elephant riding and rafting are included. 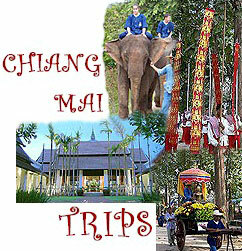 This tour is a private trip to visit the Chiang Dao Elephant Camp approx. 60kms north of Chiang Mai . 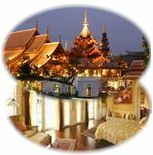 It is one of the best elephant camps in Northern Thailand. It also includes a visit to the Padong "long neck" tribe just outside Chiang Dao. The trip departs 0830 ; elephant riding, rafting, lunch & entrance fees are included. Pick up and drop off at your hotel.